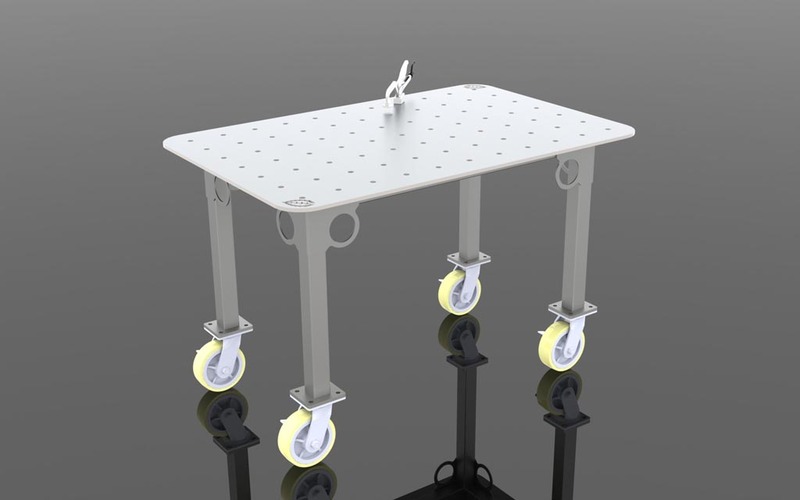 After five long years we have decided to retire our little welding table and build a new small versatile table that will allow us to build more precise parts. This below 3d model is the design we came up with. The hoops are for ratchet strapping parts down easily to the table, hanging clamps from or to stick PVC tubes (containing TIG filler wire) within close reach without getting in the way. 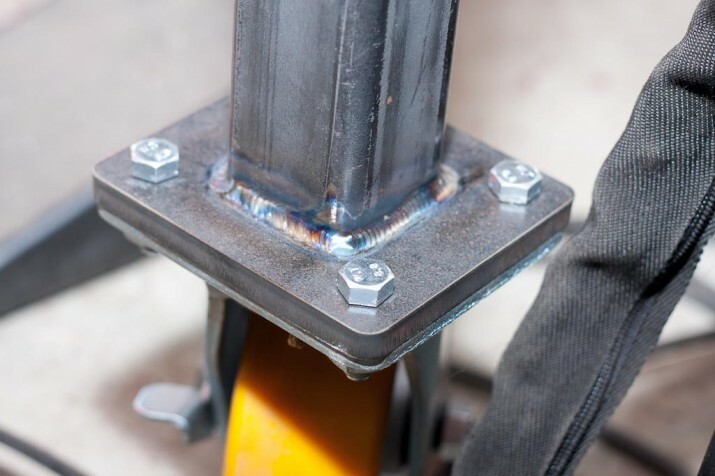 The corner gussets also allow for the lack of bracing on the bottom of the legs. The less things under the table we find the better. 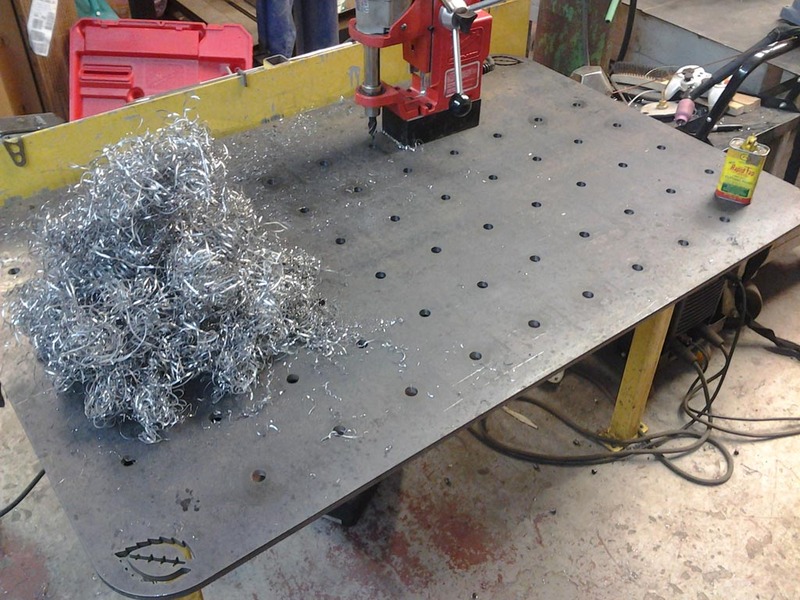 We cut the top on the CNC plasma table and began cutting up some 2″x2″ HSS tubing for the base. 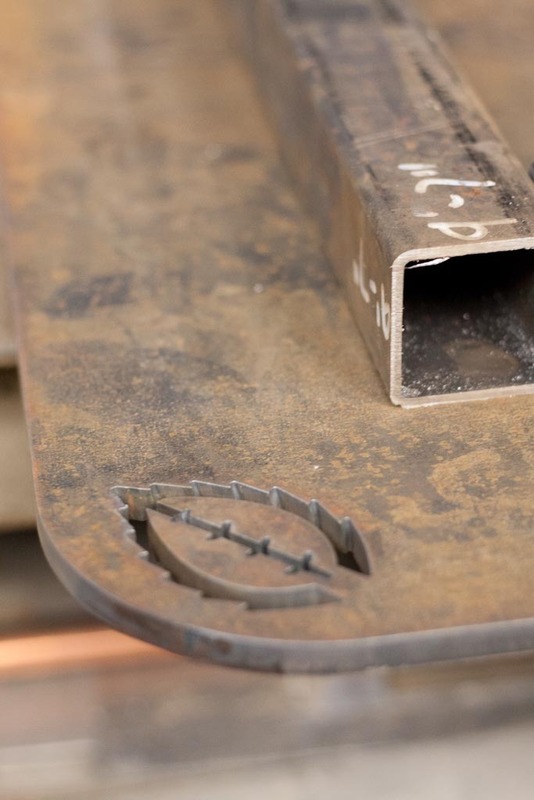 The CNC cuts pretty good detail out of 3/8″ steel, with little to no dross and angularity. Prior to the table being cut out the plate marker was used to center mark where all the holes would be drilled (4″ on center in both directions). 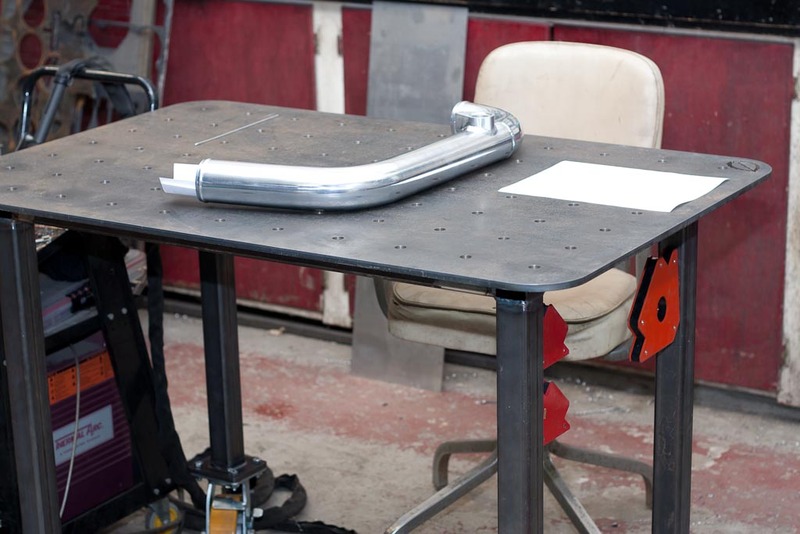 This will allow for fixtures that can be installed to clamp parts down to the table prior to welding. We feel like a steel wool factory. The mag drill with annular cutter made quick work of this table top. 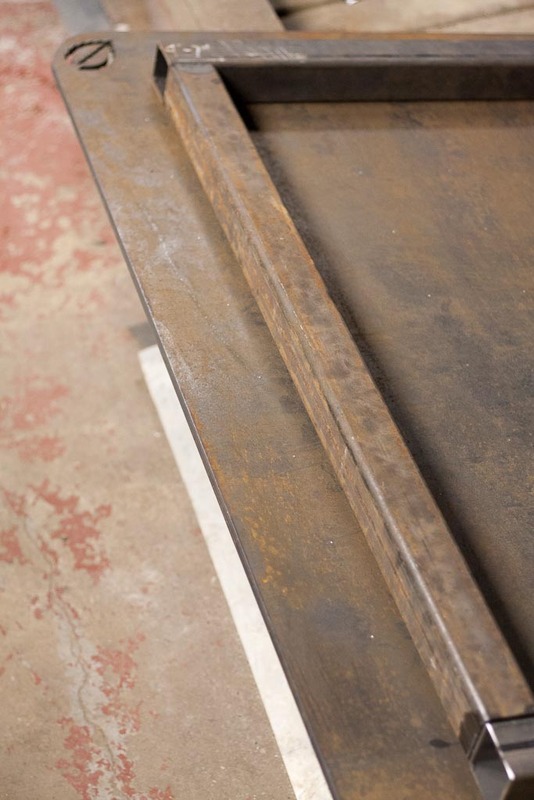 All the drilling was done after the 2″x2″ steel frame was welded on the underside of the table top. 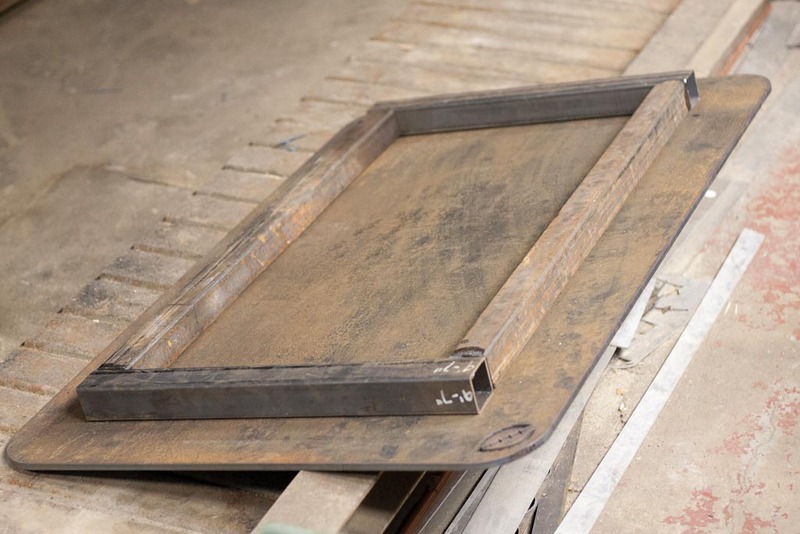 Having this frame welded on ensures that any residual stresses after drilling don’t allow the table top to warp. We didn’t want to induce any warping during the fabrication process, but the table doesn’t need to be precise enough to be blanchard ground. With the top drilled it was time to weld up the frame. Legs are completed and welded up to the 3/8″ steel feet which are bolted up to the caster wheels. Already being put to good use! 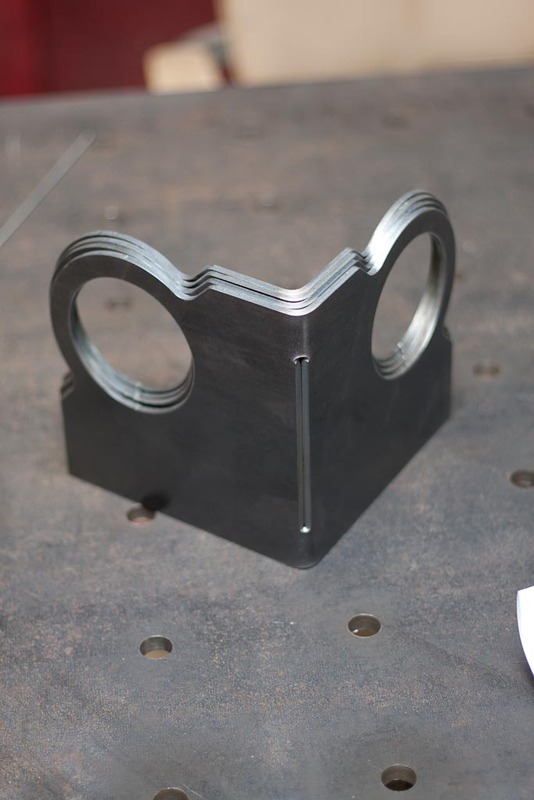 The gussets are formed and ready to be welded on. The plasma cut slit on the bend line makes it easier to bend the part as well as gives a clean area to weld the gusset to the leg.